I truly enjoyed my (unfortunately short) stay in Sor Vorapin Gym. 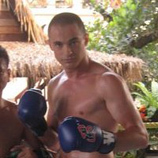 Training was hard, but a lot of fun with nice trainers and other Muay Thai enthusiasts. The gym has a really familial atmosphere; you train, eat, relax together and sometimes have a drink or two. Food is great, and people are really relaxed outside of training. If you need to be in the heart of Bangkok it’s not for you though, as the gym is in a quiet suburb that has a distinctly rural feel. Great to really focus on training and relax your mind though. I did improve and learn quite a lot in my few days and hope to keep all the techniques in mind after I leave Thailand. So many thanks to the trainers and staff at Sor Vorapin gym, I will return if I can!